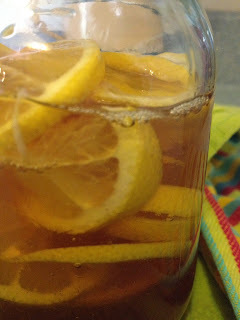 This herbal home remedy or tonic is one that I make frequently, especially during cold and flu season. Store the Elderberry Honey in the refrigerator where it should stay fresh for 2-3 months. I take one tablespoonful daily as a tonic to help build immunity and keep colds at bay before and during cold and flu season. When a cold or flu does sneak up on me, I take 1 tablespoon 3 times a day. As a bonus, Elderberry Honey tastes great! I sometimes add a spoonful to my cup of tea in place of plain honey just because I enjoy it. I buy my elderberries from Mountain Rose Herbs, my favorite place for buying all things herbal. They also sell Elder Berry Syrup if you'd rather not make it yourself.